Offering exquisite location and absolute privacy you can enjoy unobstructed views of the sparkling Santorini view. 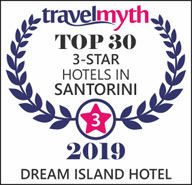 The Villa Santorini introduce the essence of living with two master bedrooms, combined with a touch of blue, blend in perfect harmony with the azure sky and sea from the wide floor to ceiling windows. 20% deposit from the total cost to secure the booking. 1. For booking cancelled more than 20 days from the arrival date, the deposit is fully refundable. 2. For booking cancelled less than 20 days from the arrival date, 50% of the reservation fee will be charged. 3. For no-shows. the full fee is charged (100%). Breakfast is included in the above prices. No charge for children under 4 years old. 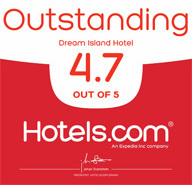 Guests wishing to keep their rroom up until 18:00 are charged at 50% of the room daily rate. The full daily rate is charged for stays past 18:00. Copyright @ 2019 Dream Island Hotel. All right reserved.